Editor’s note: To submit a nonprofit announcement to The Sentinel’s Religion section, contact Erin Thompson at (717) 248-6741 or by email at ethompson@lewistownsentinel.com. Items also may be faxed to (717) 248-3481 or sent to The Sentinel, 352 Sixth Street, Lewistown, PA 17044. Items should arrive to The Sentinel by Wednesday afternoon for publication in the Saturday edition. Submissions will be published as space allows. The editor reserves the right to edit all submissions. LEWISTOWN — The Sky family will perform Celtic Revival at 6 p.m. Feb. 9 at Bethel AME Church, 23 Juniata St., Lewistown. The Sky family is a nationally-acclaimed group whose production includes high-energy music, dance and gospel. Bishop Ricardo Huffman will also sing. No tickets are required. A love offering will be accepted. Information: (717) 953-4010. Celtic Revival will also have a performance at 10:30 a.m. and 6 p.m., Sunday, Feb. 10 at Evangel Baptist Church, 375 W. 5th St, Lewistown. No tickets are required, but a love offering will be accepted. REEDSVILLE — Church Hill United Methodist Church, 199 Woodland Circle, Reedsville, will host a mosaic art class 10 a.m. to noon Feb. 9. Artist Julie Snyder will teach attendees to make photo frames with glass and tesserae. The cost is $25 per person. Call (717) 667-3778 to register and leave a message. Money is due at the time of the class. Refreshments will be served. LEWISTOWN — There will be a free concert in a coffee house setting at 7 p.m. Feb. 9 at Ellen Chapel Church in Ferguson Valley. The Shade Mountain Gospel Bluegrass Band will provide entertainment. Beginning at 8:15 p.m., the Penn State University Singing Lions will entertain. Get a cup of coffee or iced tea and enjoy the music. Coffee and iced tea are provided. Snacks will be available at intermission. There is no charge to attend but donations will be accepted. REEDSVILLE — The Reedsville United Methodist Church will hold a free movie night at 6:30 p.m. Feb. 10. Refreshments will be served. All are welcome. McALISTERVILLE — Gary Krabill will share at 10:15 a.m. Feb. 10 at Stony Run Mission Church, 2825 Evendale Hill Road, McAlisterville. McALISTERVILLE — Ron Landis will share at 10:15 a.m. Feb. 17 at Stony Run Mission Church, 2825 Evendale Hill Road, McAlisterville. BELLEVILLE — “An Extraordinary Journey,” will be shown at 7 p.m., Sunday, Feb. 17, at Big Valley Brethren in Christ Church. The moving new film release from the Billy Graham Evangelistic Association, tells the story of the Rev. Billy Graham’s life and ministry. The church is located at 81 Wagner St., Belleville. For direction or information, call (717) 935-5052. MIFFLINTOWN — Grace and Truth Presbyterian Church will hold an informational meeting at 7 p.m. Feb. 21 at the Juniata County Library’s community room. The church is part of the Orthodox Presbyterian Church. McALISTERVILLE — Revival services with Mike Moore will be held Feb. 24-27. Services will be 9:15 a.m. and 6 p.m. Sunday and 7 p.m. Monday, Tuesday and Wednesday at Stony Run Mission Church, 2825 Evendale Hill Road, McAlisterville. LEWISTOWN — Sacred Heart of Jesus Church will begin adult Bible study at 7 p.m., Tuesday, Feb. 26, in the Parish office at 9 N. Brown St., Lewistown. The afterlife will be studied. Pick up materials at the parish office. A $20 donation is appreciated. All are welcome. Contact the Parish office for more information: (717) 242-2781. 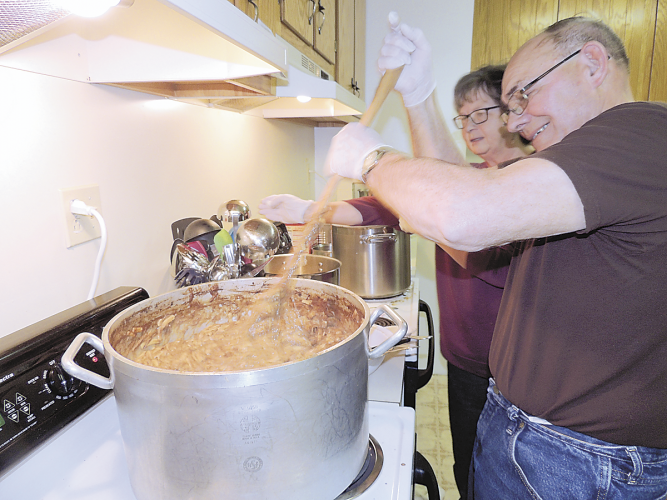 REEDSVILLE –Reedsville United Methodist Church, 60 E. Logan Street, will host a dessert auction at 6:30 p.m., Sunday, Feb. 24. Attendees can get a sample of each dessert for $1 and a chance to bid on their favorite. Proceeds go to the church improvement fund. BURNHAM — Windy Hill Bible Church will be holding a hymn sing from 6-7 p.m. Feb. 24. Refreshments and fellowship will follow. PORT ROYAL — Men’s prayer breakfasts are set for 7 a.m. on the following dates. The meals will be served at the Port Royal community building, 212 4th Street. LANCASTER — Granville United Methodist Church is hosting a bus trip to see “Jesus,” the musical, at Sight and Sound Theater and a supper at Shady Maple Smorgasbord on Saturday, March 16. There is a $20 deposit. The trip is $147 per adult and $98 per child age 4-10. Final payment is due Feb. 15. The trip will depart from the Mifflin County Library at 9 a.m. Attendees will arrive at Shady Maple Smorgasbord and Gift Shop at 11:30 a.m. and go to Sight and Sound Theater at 3 p.m. For ticket information, call Deb Kohler at (717) 348-1590. McALISTERVILLE –Mended Heart will sing at 6 p.m. March 10 at Stony Run Mission Church, 2825 Evendale Hill Road, McAlisterville. McALISTERVILLE — Jim Weller will share at 6 p.m. March 31 at Stony Run Mission Church, 2825 Evendale Hill Road, McAlisterville. MIFFLINTOWN — Juniata Mennonite School will hold a ham supper 2-7 p.m., Friday, May 3, at Cedar Grove Brethren in Christ Church, 287 Deerville Road, Mifflintown. Purchase tickets or walk-ins welcome. LEWISTOWN — World Bible School correspondence courses will be offered through Lewistown Church of Christ. Anyone interested may email lewistowncoc@gmail.com, or write 301 South Pine St., Lewistown. LEWISTOWN — The Sentinel invites area religious leaders to submit columns for “Professions of Faith” in the Sentinel’s weekly religion section. Interested individuals may contact Erin Thompson at ethompson@lewistownsentinel.com or (717) 248-6741, ext. 117. Sermons should be limited to 1,000 words; exceptions may be made at the editor’s discretion.